Brittle failure is the brisk propagation of cracks through a material. This typically occurs so quickly that no plastic deformation takes place before fracture occurs. 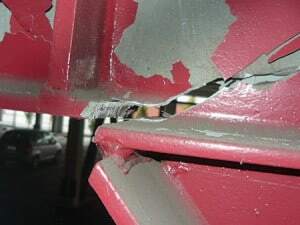 In structure failures, brittle failure usually causes a failure in structural integrity. Because of the rapid nature of this failure, it often leads to catastrophic failure as there is little indication between the start of failure and full rupture. Brittle fracture is caused by impurities in a material, whether that is due to manufacturing inconsistencies, small notches in design, or fractures that occur during service. These small impurities cause a small crack which then initiates the rapid propagation of other cracks throughout the material. Many non-metal construction materials are brittle, or lacking ductility, and as such are subject to brittle fracture. Glass at normal operating temperatures is particularly subject to brittle failure. Metals which undergo brittle fracture are usually high-strength or stiffened in some way. This increased stiffness causes a decrease in ductility which prevents plastic deformation from occurring before fracture. 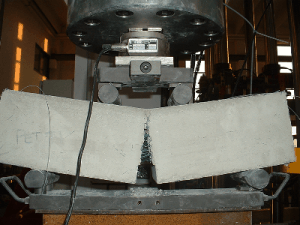 Yet if there is a stress concentration, a tensile stress, and relatively low temperature, brittle fracture can occur in normally ductile materials as well. In buildings, reinforced concrete beams must be designed such as to avoid brittle fracture which occurs due to over-reinforcing. When a beam is over reinforced, the concrete crushes in compression before the steel reaches its full yield point. This is an undesirable mode of failure (as opposed to a gradual ductile failure due to under-reinforcing) because rupture occurs without warning.